Two of our booklets about Harwood which have been out of print for some time are now available again. We've had a limited reprint run of both done due to the volume of requests we were getting from members of the public. They are available to buy through Amazon, or see our "how to buy" page. Harwood Hill Farms & Riding Gate, by J. J. Francis, is a historical study of Riding Gate, and the Knotts farms in Harwood together with the adjacent Old Neds Farm in Bradshaw. 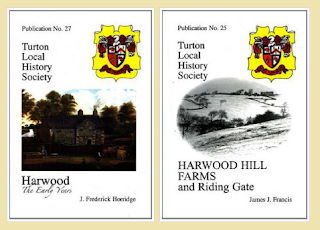 Harwood: The Early Years, by J. F. Horridge, is a study of the development of the township of Harwood from Anglo-Saxon times to the present.